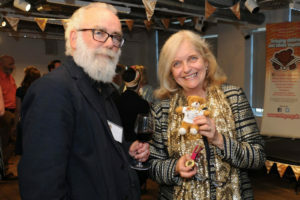 OxFedTed and Jackie (Chair OCBG) meeting a fellow bookworm at the FCBG 50th Birthday celebration at Foyles’’s Bookshop, in London. 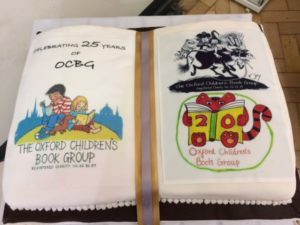 Last Saturday at the Story museum in Oxford, we celebrated the Oxford Children’s Book group’s 25th anniversary. Of course, 2018 is also the FCGB’s 50th, so we had a ‘double whammy’ and ‘twice-as-blingy’ reason to party! 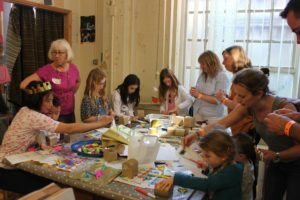 There were all the ingredients needed for a birthday party: gold and silver balloons; bunting; crafts; dressing up opportunities in the Museum’s talking throne room; Fairy Fizz to drink; and crisps, popcorn and cake! Most of the children (and grown-ups) made their own gold and silver crowns to wear, and decorated golden treasure chests with jewels, because, I am sure we would all agree, a great book is like a valuable, much-loved, and often-hoarded treasure! 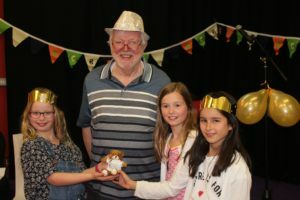 The OCBG was delighted to welcome, as a special guest, former headteacher and author Neil Griffiths who enthralled us with his story about Itchy Bear. Neil is the original inventor of Storysacks, which (as you know) have figured large in our group over the last two years. We were all mesmerised by the powerfully told King Midas story, written and read by award-winning author of over 175 children’s books, and long-time member of OCBG, Geraldine McCaughrean. Local author- member, Cas Lester, then entertained everyone with her series of books about the naughty Fairy Nixie. 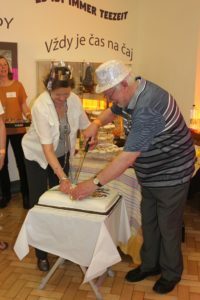 Finally, well-known and prolific children’s poet, John Foster, who was a foundermember of OCBG, helped a fellow founder member, Moira da Costa, cut the huge and stunning birthday cake, which displayed the three logos which OCBG has used over the last quarter of a century. She reads in the car. She reads on the bus. If you try to stop her reading she causes a fuss. Read as much as you like. Read all day. 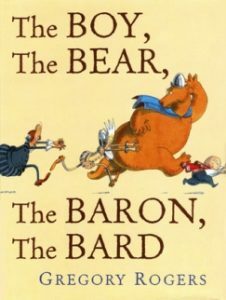 Of the Federation’s Children’s Book award. When you think she’s asleep, she will switch back on the light. Where she can borrow books for free. Who has been inspired by the Federation. There’s a child over there with her head in a book. So, thanks to the generosity of the Story Museum and the committee’s hard work, it seems the party was a good way to celebrate the last 25 years of regular and special events, through which we have reached out to thousands of children, to encourage them to read and to love stories and books of all kinds. 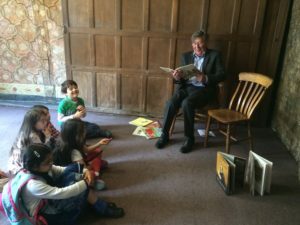 Bringing children and books together is always worthwhile, so here’s hoping that we can keep going for another 25 years….?! Jackie Holderness (Chair OCBG) with grateful thanks, as ever, to the OCBG committee members: Florence Benfeghoul, Moira da Costa, Erica Davis, Mary Roberton, Fay Sinai, Jo Steele, Harriet Steele (possibly the youngest Committee member in the country? 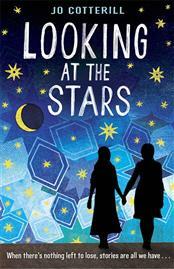 ), Louise Stothard (FCBG Executive for NSSM). 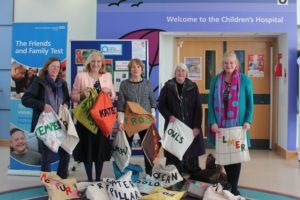 For the second year running, the OCBG has created and donated 20 Story Sacks for the children’s wards in the NHS Hospital Trust. 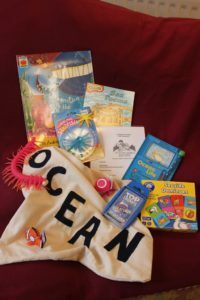 Each sack contains at least one story book, non-fiction book, toys, games and puzzles, to enrich and develop the themes in the story. 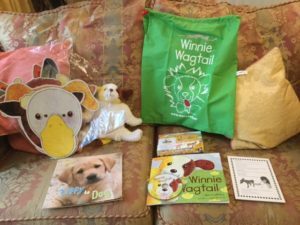 Because the sacks are to be used on the wards, everything in the sack has to wooden or plastic, to minimise the risk of infection, but the contents can still generate a lot of interest and help to make reading and learning fun! The Hospital school teachers have been using the first 20 Story Sacks with children across several hospitals and have found them very useful indeed. 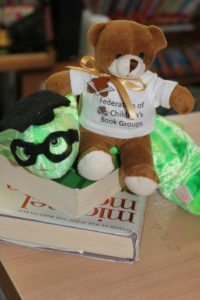 “The OCBG always marks World Book day in a special way. For the last three years, we have donated sets of story books to local Hospitals and Children’s Hospices in Oxford and Banbury. 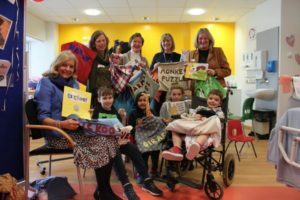 Last year, however, we decided to make and donate 20 Story Sacks to the Children’s Hospital School, at the John Radcliffe Hospital, to mark World Book day. 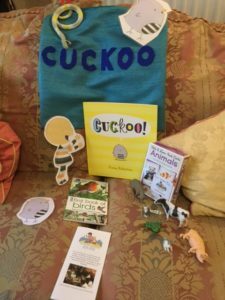 Having seen Story Sacks in action in a wide range of settings, I still get a great deal of joy to see how excited children are to open the Story sack. They love peering inside the sack to see what treasures it contains. They always find a story book, together with a non-fiction book, characters or scenes from the story, games, toys and puzzles. 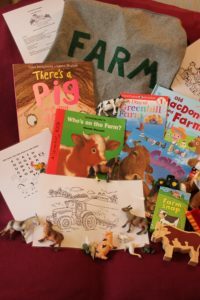 All these props are designed to bring the story to life and give children ways to retell and re-enact the story. Our hope is that these Sacks will give sick children hours of entertainment and educational fun, during their time in hospital. ‘We are so grateful to receive these incredible story sacks made by the Oxford Children’s Book Group who have been tirelessly putting together the story sacks for months. At the children’s hospital, we often teach children by their bedside. It is very important that anything we take to the children can be wiped down to reduce the risk of infection and one of the lovely things about these story sacks is that everything included can be wiped down, ready for the next child to investigate and enjoy. Thanks to comments like these, the OCBG promised to create more Story sacks and, indeed, have managed to produce another 20 which we will present to the Hospital School on March 16th. Neil Griffiths, the original creator of Story Sacks, is very pleased his idea is proving so useful in the Hospital School. 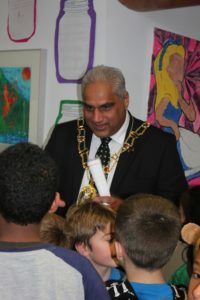 He has agreed to come to Oxford to celebrate the OCBG’s Silver anniversary on May 5th, at the Story Museum. For more details, please see above. 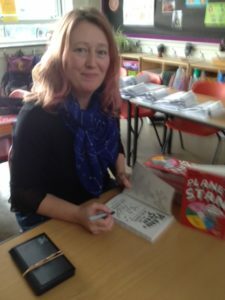 28 February 2018: Author Visit to Dry Sandford School Primary School: Elaine Wickson visited the children at Dry Sandford School to talk about her book Planet Stan. 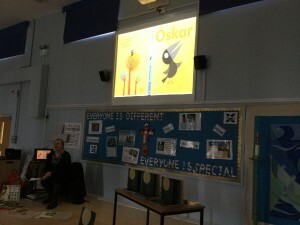 Report from Moira: We enjoyed a brilliant visit by Elaine Wickson to Dry Sandford School on Wednesday. The children were so responsive; I think Planet Stan promises to be a great success. 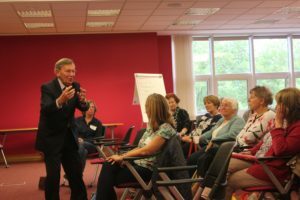 The teachers were also most enthusiastic and John Smith, a retired teacher, who was there as a supply teacher, was so keen that he was planning a creative writing session immediately afterwards. NOVEMBER 8th : AGM and celebration of NNFN (National Non Fiction November) with Charlotte Guillain, a local and award-winning non-fiction author. 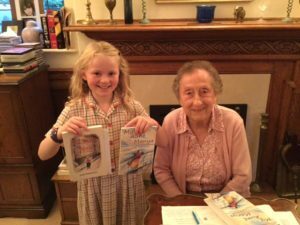 We enjoyed a wonderful convivial evening on Wednesday 8th November at our AGM celebrating National Non-Fiction November with Charlotte Guillain sharing her experiences and the joys of writing non-fiction books for children. OCTOBER 7th: Biennial OCBG Conference: A World of Words. 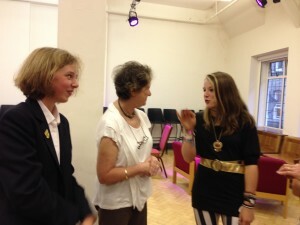 All our guest speakers were brilliant. They deserved a larger audience, but the 40 or so attendees all realised how privileged we were to be able to spend a whole day in their company. Sadly, our own Treasurer, Fay, was too ill to attend, but her efficient administration beforehand ensured it all went very smoothly. The venue provided for us once again by Oxford University Press was wonderful, and OUP colleagues were all most helpful. The day started with prolific YA author, Joss Stirling (she also writes as Julia Golding and Eve Edwards), followed by Tom Moorehouse, whose slides and takes of voles greatly appealed. Next came Sam of OUP Dictionaries who gave a fascinating insight into the children’s language and how dictionaries at OUP have evolved to keep up with changing words, needs and technologies. We were entranced by Sam’s work on the Roald Dahl dictionary, which is great fun. 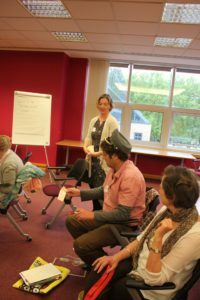 Isy Mead of the Story Museum shared her enthusiasm for story and also described for us the latest exciting happenings at the museum, which will be closed for refurbishment, but very active off-site with pop–up museum events and outreach activities. Nicky Thornton, former owner of Mostly Books, talked next about changing from a bookseller into a book writer. Nicky won the Times/ Chicken House award with her first novel (The Firefly Cage, which will be published very soon! 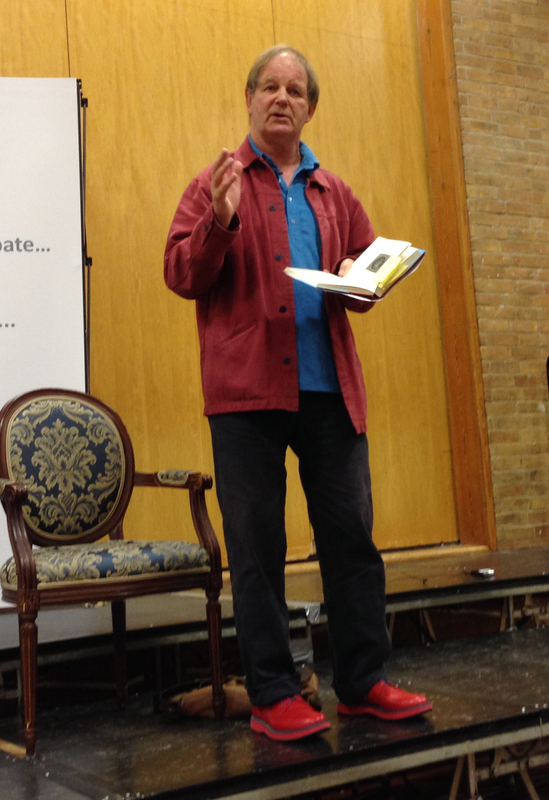 The day finished, with another talk by Bill Laar, one of our regular Conference contributors. His ability to engage the audience and share countless stories about stories made sure that we all left the Conference on a high! Delegates came from as far as Ipswich, Cambridge, Somerset and Birmingham, and all the feed back has been positive. This event started with a showing of the full-length Storyfest film which was made when Anna Conomos led three schools (including St Aloysius) in a brilliant performance of Jason and the Argonauts. 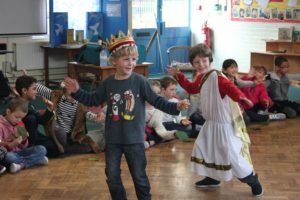 The children were thrilled to see the whole play once again, and amazed to see how much they had grown in just 7 months! The Book Swap went so well, we were almost overwhelmed with young readers exchanging their own books for different ones. The school, a relatively new OCBG member was delighted by the afternoon and said it gave reading in the school a real boost! There were lots of enthusiastic parents there as well because the Book Swap started at 3pm. If you would like to have a Book Swap in your school or locality, please get in touch. All the school needs to do is send out a letter in advance, and organise a large room or hall. We do the rest. 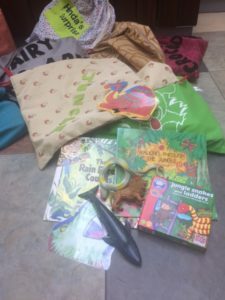 OXFORD CHILDREN’S BOOK GROUP DONATES STORY SACKS TO THE CHILDREN’S HOSPITAL! 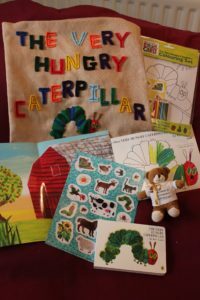 A few months ago, OCBG was approached by the J.R. to make Story Sacks for the Children’s Hospital. 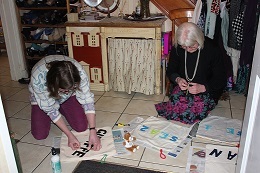 Story Sacks normally contain soft toys but the group needed to devise germ-minimising Story Sacks which could be used by children on the wards. 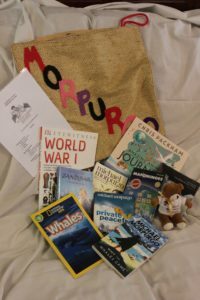 OCBG made 20 Story Sacks to give to the Children’s Hospital, in honour of World Book day. 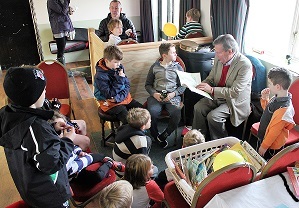 The Story Sacks were officially launched on March 6th at 11am, at the J.R.
One of these Story Sacks was donated by Neil Griffiths who invented Story Sacks for use in his Swindon school. 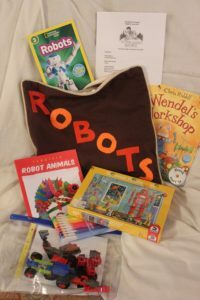 Since then, the concept has grown and Story Sacks can now be purchased ready-made, and found in schools world-wide. Each sack costs at least £50, so by creating and donating 20 sacks, the OCBG has saved the Children’s Hospital £1000! 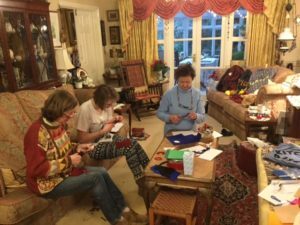 Being a small charity, the OCBG could not afford to purchase Story Sacks for the hospital, so instead they have been hunting washable toys and props and holding workshops, where they have worked hard, sewing, gluing, and enjoying themselves. OCBG’s Annual General Meeting was held on Wednesday 2nd November 2016 at Windrush, Hamels Lane, Boars Hill, Oxford. Following the AGM at 7.15pm we were pleased to welcome Georgina Atwell who talked to members about Toppsta. 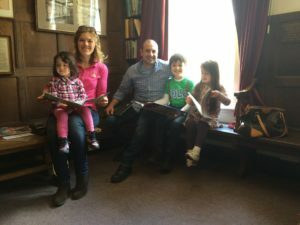 Georgina ran Apple’s e-book store in the UK before leaving to start up Toppsta, now the UK’s largest Facebook community reading and reviewing children’s books. With the website www.toppsta.com on track to have over 10,000 book reviews by the end of the year and personalised emails sent out to registered users each week, Toppsta helps parents, teachers and librarians discover great books for children. 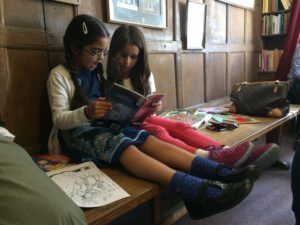 On 27th September together with The Friends of Kennington Library OCBG welcomed Claire Barker, author of Knitbone Pepper Ghost Dog, to the Kennington Library. Claire had come from her farm in deepest darkest Devon to talk to us about her book, the third in the delightful Knitbone Pepper series. We all enjoyed listening to her lively descriptions of the activities and mayhem caused by her ghostly characters at Starcross Hall. It was a very entertaining evening and I can definitely recommend that both boys and girls of 7+ read these warm and funny stories. 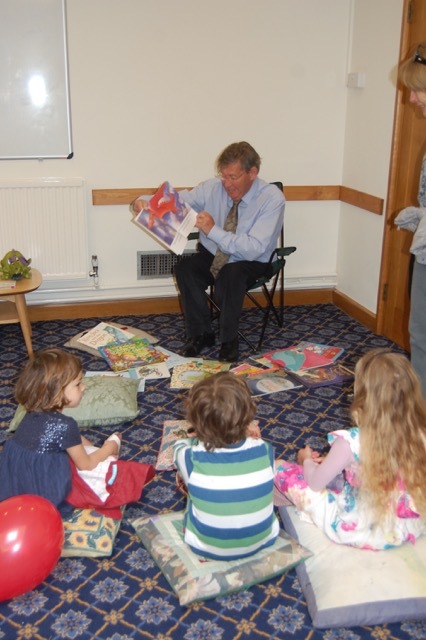 On 26th October during half term OCBG ran a delightful Storytelling event at Kennington Library. 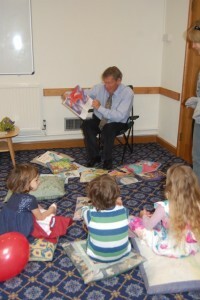 Storyteller Jackie Singer, kept several children highly amused and entertained. Jackie loves finding new stories to share. 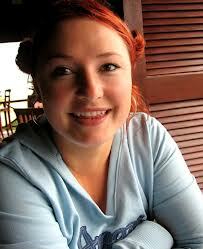 She is highly imaginative and the stories she told were about animals from all over the world. 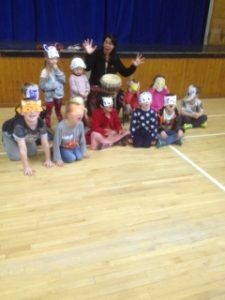 The children then made exciting animal masks and the results were brilliant. On June 29th, OCBG members enjoyed a delightful summer social, with buffet supper, at Moira Da Costa’s house in Boar’s Hill. 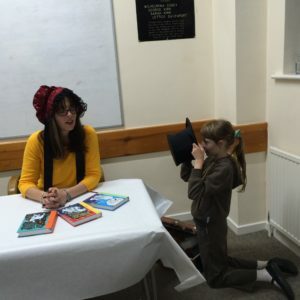 We were delighted to be joined by local author Josie Patterson, author of ‘No buts, Becky!’ and ‘Angels, Prophets, Rabbis & Kings from the Stories of the Jewish People’ (World Mythology Series). Josie entertained us with extracts from her new book ‘My Aunt Manya’ which is based upon her grandmother’s experiences. The riveting tale had us all spellbound and our youngest guest couldn’t wait to start reading it, as you can see! Thanks to everyone who came along and who brought with them so much delicious fare, to Moira for hosting us so well and to Josie for sharing with us her journey as a writer. It was a truly thought-provoking and memorable evening! On 14th May, thanks to the generosity of Oxford Preservation Trust, OCBG were able to use a rarely open and very special place in the centre of Oxford. We decided in this 400th anniversary year of Shakespeare’s death, we would invite our members to listen to and share stories in Oxford’s secret gem, the Tudor Painted Room. This room could share a lot of history with us. Originally, a medieval inn, in more recent times it has served as a study for poet John Betjeman. 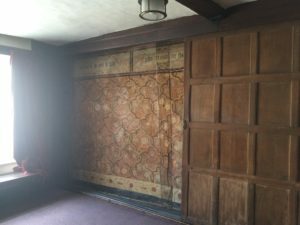 However, it is most famous for the stunning Tudor wall paintings which adorn the walls in a room where William Shakespeare used to stay with his landlord friend John Davenant. In the 16th Century, the building was known as the Crown Tavern and Shakespeare used to stay there en route from Stratford-on-Avon to London. His players used the courtyard below to perform their plays and Shakespeare became Godfather to John Davenant’s child. To protect the walls of the room, we had to organise specific time slots, so access was very limited. 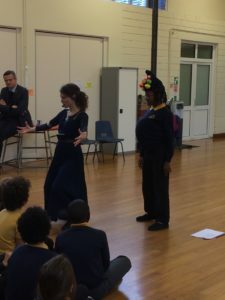 Still, always willing to make a fool of herself, our chair, Jackie, came dressed as Mrs Shakespeare and Bill Laar, a mesmeric storyteller, entertained the children. 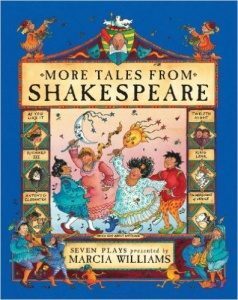 The OCBG team had also brought along some lovely Shakespeare-themed picture books so the children were also able to just enjoy reading to each other and with their parents in this most unusual place. 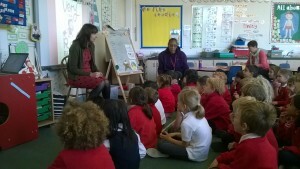 On Friday 15th April, German author /illustrator Britta Teckentrup met children from years 1, 2 and 3 at St Andrew’s School, in Headington. 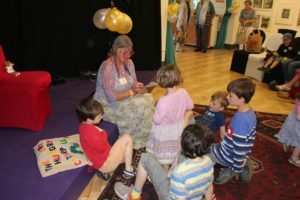 Britta has published over 80 titles, including Big Smelly Bear, the Grumpy Cat, The Tree and many more… All 90 children very much enjoyed Britta’s lively power point introduction to her stories and illustrations. They listened carefully to Britta’s powerful new story: Before I wake Up (published by Prestel Publishing) and also to her next story about Oskar, who was a crow who loved everything. 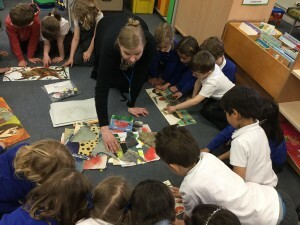 The children also enjoyed guessing what Britta’s unique collage images depicted and then identifying Britta’s favourite foods, animals and birds. At the end, there was a lively Questions and Answers session. The children asked some brilliant questions and were clearly appreciative of the creative process and all that it entails. Once the session in the school hall was over, Britta offered to visit each class, to share her original artwork with the children. 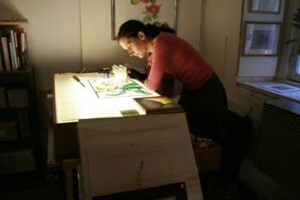 This was a real bonus, as they were allowed to feel the textured papers that Britta uses to create her pictures. The children learned how to create collages and how to depict emotion through shapes and facial expressions. Each class were then able to ask Britta more questions and learn more about picture book illustration and publishing. OCBG is very pleased to welcome St Andrew’s as a school member. The school, which has an annual Book Festival, was delighted to host the event and thanked Britta with a stunning bouquet of flowers. 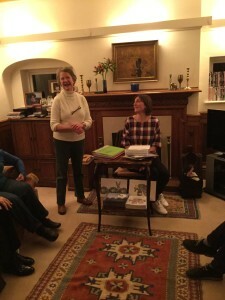 On 16th March OCBG members were delighted to welcome local author Zoe Greaves to a Bring and Share supper. After a delicious repast, Zoe explained how she had moved from selling and publishing books to writing them herself! Together, with her mother Lesley Sadleir, she has produced beautifully produced picture books which are destined, we feel sure, to become children’s classics. The most recent title, ‘Hare’, has a poetically rich text, graced with and brought to life by, Lesley’s exquisite and botanically accurate illustrations. 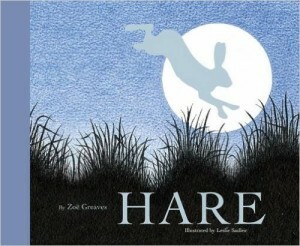 We learned a great deal about the vital interplay of text and image, and also quite a lot about hares! It was all fascinating and we could have listened to Zoe all night. She talked about her love of language, her passion for reading, and her many and interconnected past and present roles within the publishing world. We are very pleased that she is going to join the group and we hope she may contribute to other planned OCBG events in the future. At our AGM on November 18th this year, we were thrilled to welcome as our guest speakers, Harriet Impey and Katie Pickwoad, talented authors and illustrators who grew up and went to school here in Oxford. Katie and Harriet now live in London and Leiden respectively but they have collaborated and known each other since they were two! 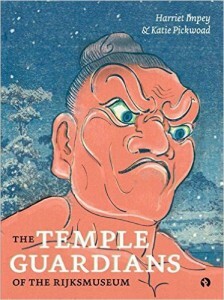 Both their exquisite picture books (‘A bowlful of happiness’ and ‘The Temple Guardians’) are visually stunning. 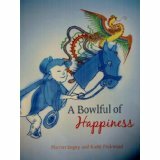 They are very cleverly constructed and based upon oriental art in well-known museums, including the Ashmolean whose porcelain collection inspired ‘A bowlful of happiness’. Those present all enjoyed the evening very much indeed and would highly recommend both these exquisite books. 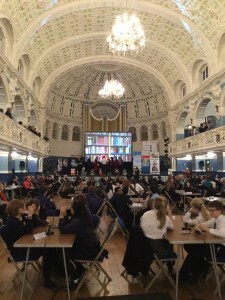 The Finals were held at the Oxford Town Hall on Friday 4th December. Many congratulation to Hamilton College who will be travelling to New Zealand in the Summer for the World Finals. We wish them the very best of luck. Our local team from Cokethorpe School performed splendidly, we are very proud of them and look forward to supporting them again next year. On Sunday, 27th September, the OCBG hel d a relaxed and successful family event at the treacle well in Binsey. 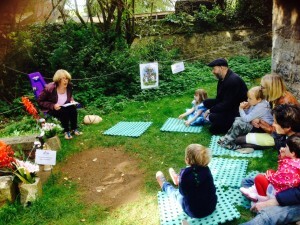 Despite the remote location, our Treacle Well Tales, attracted over 100 children and parents, to celebrate the 150th anniversary of the publication of Alice in Wonderland. 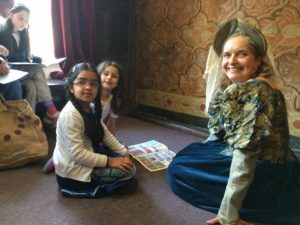 The children also enjoyed meeting storyteller, Julie Pottle, who brought along the Story Museum’s touring Alice exhibition, which took up most of the tiny church of Saint Margaret. Outside, the weather was very kind to us all, so children could listen to extracts from Lewis Carroll’s much-loved book next to the well or under the huge yew tree. There w ere several fun activities on offer: making big bubbles; finding ‘curiouser and curiouser’ things on a Wonderland Treasure Trail; fishing for ducks in the Pool of Tears; pinning the grin on the Cheshire Cat; icing ‘Eat Me’ biscuits; creating red roses for the Queen of Hearts; trying the Lucky Dip; or just meeting other families and the friendly and very curious goats who live next door! The OCBG would like to thank the Rev’d Clare Sykes for enabling us to use this very special place and introduce so many families to Alice’s Treacle Well. 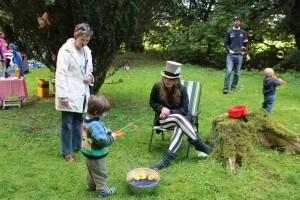 We look forward to organising more family events in the future…. 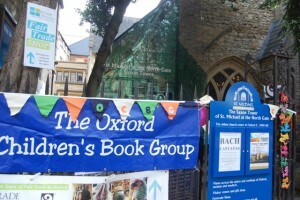 On 26th September , the OCBG ran a Book Swap and Book Shop stall at West Oxford. St Frideswide’s church on the Botley Road hosted a Bee Friendly Festival, where people could learn about the importance of bees as pollinators. 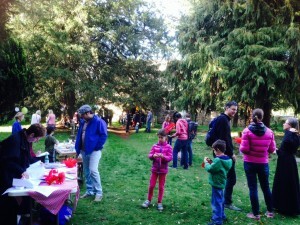 Gardeners could discover which plants will attract bees to the garden, children learned to make five-start bee hotels, and all sorts of bee-themed crafts and games were on offer. 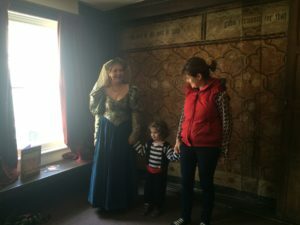 The OCBG was very pleased to take part, and we engaged with a wide range of local families, several of whom came along the following day to the Treacle Well Tales event. If you would like to invite us to take part in your next local event, please make contact. We are happy to provide a Book Swap or Book Shop with children’s books, in order to encourage more children to choose and read more books! Your Committee is delighted to announce that Oxford Children’s Book Group have won a collection of Dragon books in the NSSM prize draw. 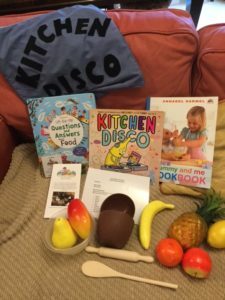 The Federation and Book Group are very grateful to the Orion, Random House, Nosy Crow and Orchard Publishers and the authors John Foster and Emma McNally for their generosity. On Saturday, 30 May OCGB held a Dragon Day at St Michael’s at the North Gate in Oxford City Centre to celebrate the Federation of Children’s Book Group’s Dragon themed National Share a Story Month. 38 children were entertained with wonderful dragon stories, made their own dragon mobiles and enjoyed other dragon themed activities. 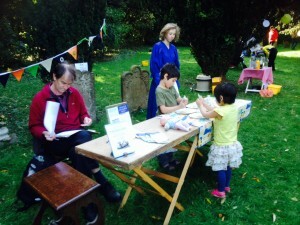 It was a pleasure to see so many children enthralled by the telling of old and new stories. 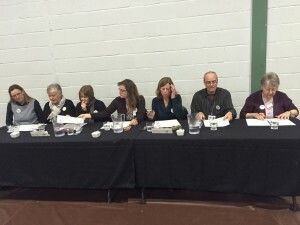 Several committee members were delighted to support the Festival by introducing children’s authors, including Caroline Lawrence, Paul Stickland, John Dougherty and Daniel Hahn. Red House Book Award testing took place across a wide range of schools during the spring term. The Red House Children’s Book Award is the only national book award that is entirely voted for by children. 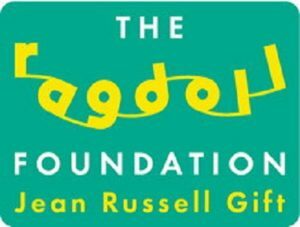 It was founded in 1980 by Pat Thompson, a member of the Federation, to celebrate the books that children themselves love reading. Each year, a shortlist is drawn up from children’s nominations and any child can then vote for the winner of the three categories – Books for Younger Children, Books for Younger Readers and Books for Older Readers. The book with the most votes is then crowned the winner of the Red House Children’s Book Award. The Day the Crayons Quit -by Oliver Jeffers and Drew Daywalt- the overall winner. We decided to mark World Book Day March 5th 2015 and the 300th anniversary of John Radcliffe, by donating two full sets of brand new, award-winning books to Oxford’s Children’s Hospital. 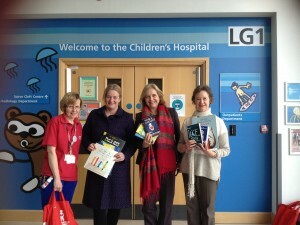 The books donated to the Children’s Hospital were the shortlisted books for the annual Red House Children’s Book Award. 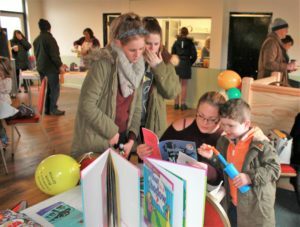 Each year, a shortlist is drawn up from children’s nominations and any child can then vote for the winner of the three categories – Books for Younger Children, Books for Younger Readers and Books for Older Readers. The book with the most votes is then crowned the winner of the Red House Children’s Book Award. 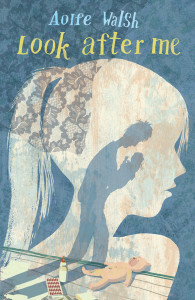 We had a great evening with Aoife, newly published local author, on 23rd October, when she spoke to us about her book, Look after me, and her journey into publishing. 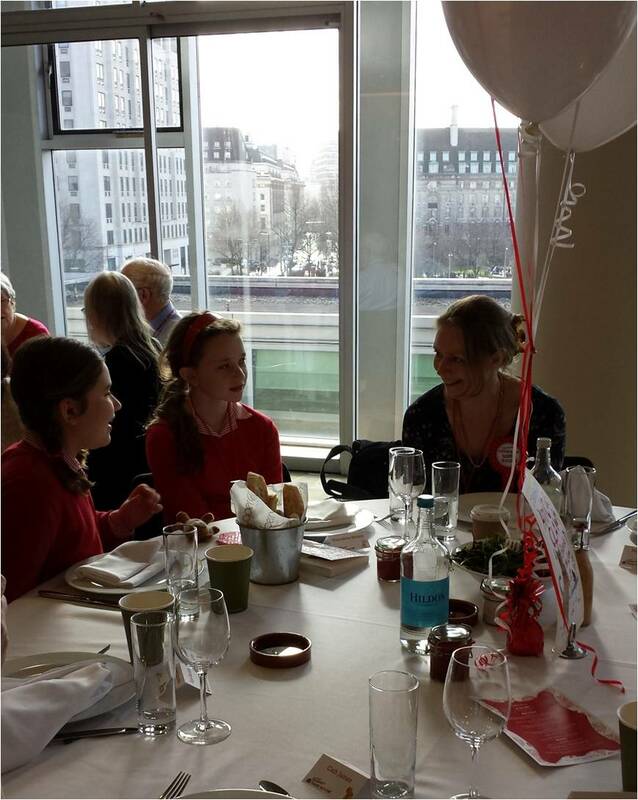 Enjoyable, friendly and inspiring – many thanks Aoife! 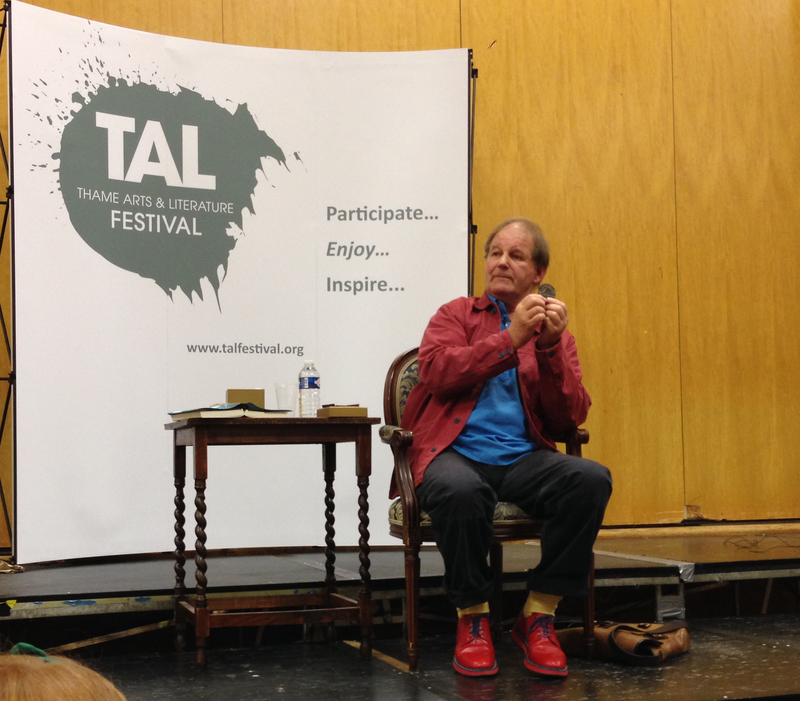 What a wonderful afternoon we had in Thame on October 18th, when OCBG was able to bring the wonderful Michael Morpurgo to the Thame Arts and Literary Festival (TAL). 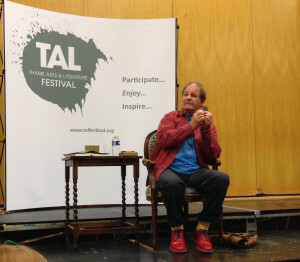 450+ people were in the hall, adults, teenagers and children, and they all loved his talk, which touched on serious issues like war and why many of his books are set in WWI, but also included lots of laughter. He told us about the seeds that spark one of his stories, like the Lusitania medal which was one of the prompts for his new book Listen to the Moon and afterwards he spoke to everyone, child or grandmother alike, who wanted to talk to him! Thank you Michael for a wonderful afternoon! 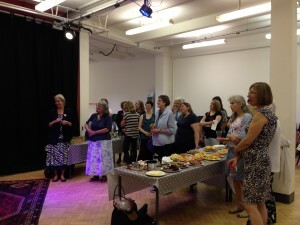 A very special party for OCBG members was held on 18th September 2014 at the wonderful Story Museum in Pembroke Steet, Oxford. 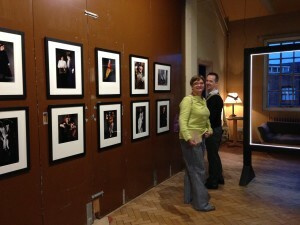 After some very yummy treats we had the opportunity of a private visit to the incredible 26 Characters summer exhibition. There was a special kind of magic in creeping through the wardrobe, brushing aside the mothball-scented fur coats and finding ourselves in Narnia! We peeped behind a curtain to see Merlin (and those arriving early enough had a quick hello from Kevin Crossley-Holland who had chosen to be portrayed as the great magician.) We explored the ship sailing to to Treasure Island with OCBG member Philip Pullman and inspected Just William’s garden shed. We discovered Michael Morpurgo (alias Abel Magwitch) hiding among the gravestones and enjoyed seeing Malory Blackman as the Wicked Witch of the West. 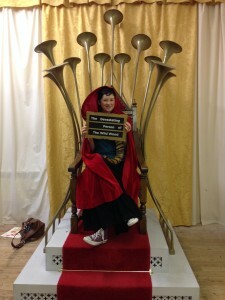 One of the most popular rooms was where we dressed up and sat on the talking throne. All agreed it was a great event and we went home still smiling! Many thanks to The Story Museum for hosting us, and to their Co-Director Kim Picken in particular for telling us the latest news, and about the creation of this wonderful exhibition. 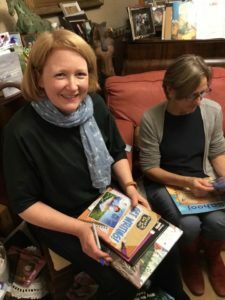 In conjunction with the Oxfordshire School Library Association (OSLA) and Blackwell’s Oxford, we were delighted to present Australian author Alyssa Brugman on 29th May. 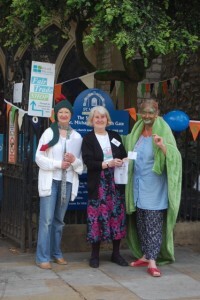 OCBG was very happy to have adopted an amazing event at the Oxford Literary Festival this year. On 30th March 2014 we introduced Stephen Butler with his Diary of Dennis the Menace, written to celebrate the 75th birthday of The Beano. Steven Butler, actor, dancer, trained circus performer and author of The Wrong Pong series, gave the inside story on every cheeky trick and prank played by the star of The Beano. We met Dennis, Gnasher and friends (and enemies) and explored Beanotown with Dennis as our guide. We were delighted to have a visit from Deborah Ellis, award-winning Canadian author of many thought-provoking and hard-hitting books for young people, including The Heaven Shop, Parvana’s Journey and My Name is X, as our guest on the evening of 20th March. As well as talking about her latest book, My Name is Parvana, Deborah gave us an insight into her visits to refugee camps in Afganistan over a period of years. Recent visits fed into books of interviews with children which she has published in Canada, including one with Native American children, one with the children in Afghanistan and her most recent, interviews with children in Israel and Palestine. It was a truly inspiring evening and we are very grateful to Oxford University Press for supporting it, and especially to Deborah for giving us her time in a very busy schedule of talks and school visits – she had also visited Our Lady’s School, Abingdon, for us in the afternoon. 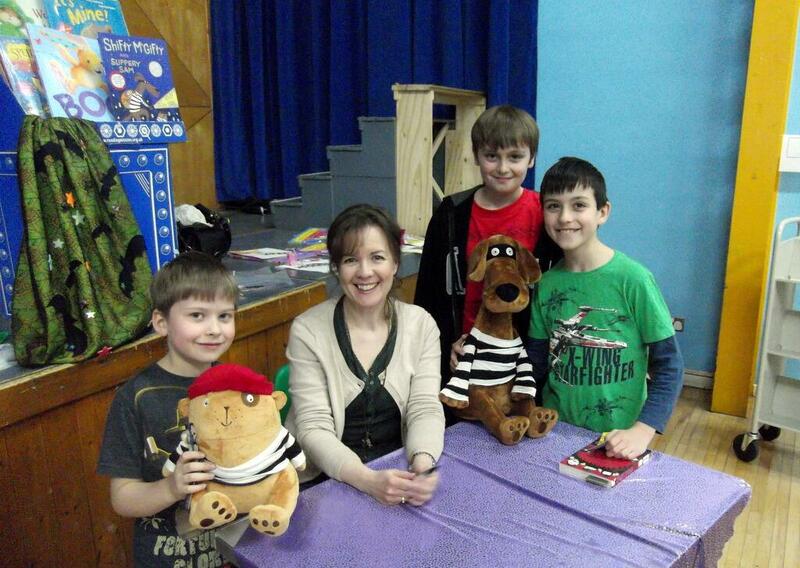 We were very grateful to Oxford author Jo for undertaking several school visits (including on World Book Day – see below) for us this term. A former teacher and actor, and now inspiring author of many books including the wonderful Looking at the Stars Jo was a hit with students and held them all captivated with her sessions. 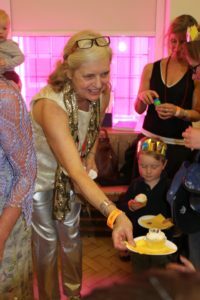 Our celebrations for World Book day this year began with a party on Saturday afternoon, 1st March, at the Kennington Library. Tracy Corderoy, our guest author, is amazingly talented and we all had a varied and very lively two hours. 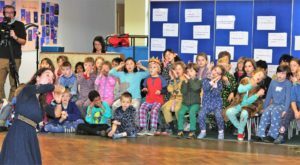 Tracy had brought inspiring costumes (made by herself) and showed her fantastic skill in keeping 60 children enthralled with her imaginative story-telling and acting ability. The books Tracey talked about were Hubble Bubble Granny Trouble, Shifty McGifty and Slippery Sam and The Glorious Granny Bake-Off. Inspired by the illustrations in The Glorious Granny Bake Off, the children also had an opportunity to show their talents in a draw a magical and fantastical cake competition. Also great fun was the craft activity that Tracey had brought with her, which involved the children making a cauldron with a pop-up frog on a broomstick. To round off the party there was an excellent tea and a thoroughly enjoyable time was had by all. 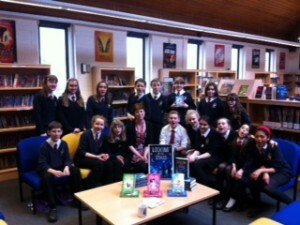 On World Book day itself we were delighted to take author Jo Cotterill to the first of several visits to local schools she is undertaking for OCBG, this time to Henry Box school in Witney, where she met members of the Book Club informally and then enthralled the whole of year 8 talking about her journey into writing, and her latest title, Looking at the Stars. 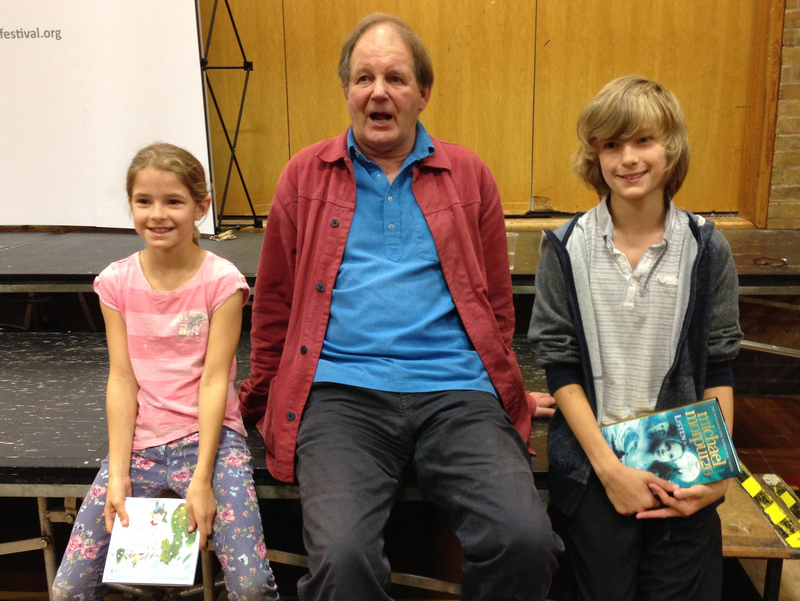 On Thursday 6th November, Year 7 pupils at St Gregory the Great School, Oxford and Marlborough School, Woodstock, welcomed Alex Woolf , Author of Soul Shadows and Aldo Moon to talks at their schools. Alex shared with the children his path to becoming an author and the obstacles he overcame on the way. 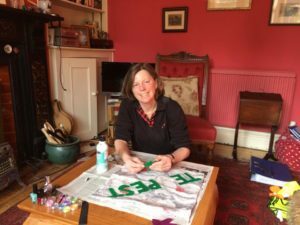 Alex has written more than 80 books, many of these non-fiction, and is very involved with Fiction Express, an exciting on-line project which enables readers to help map the path of the story. The children responded enthusiastically to the talks and had many questions to ask. A very enjoyable day was had by all. Following an excellent lunch we had more treats in store, firstly Vineeta Gupta talking about creating the Oxford Children’s Dictionaries from the children’s corpus and then the wonderful Andy Mulligan talking about Dangerous Books and the role edgy fiction can play in drawing in the reluctant older readers.